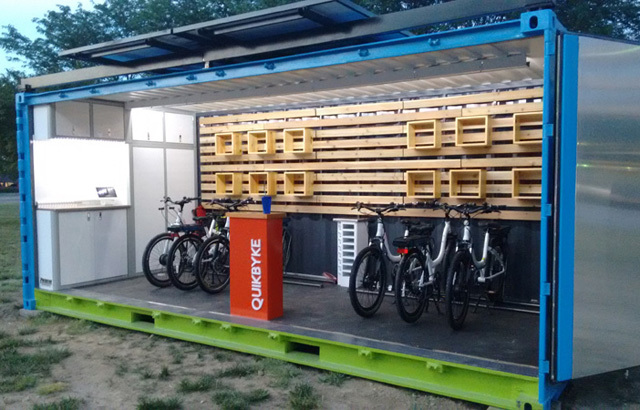 The founder of one of the longest-running electric vehicle sites on the web, EV World, is building a spin-off that will directly enter the electric mobility scene by offering e-bike rentals from a self-contained solar powered shipping container. Bill Moore’s Quikbyke system just finished a successful summer trial in Omaha, Nebraska, and will soon be in St. Petersburg, Florida, where it will serve cruise passengers and other tourists (primarily targeting baby boomers) with an affordable and renewably-powered local transportation option . . . While a pop-up e-bike rental shop might be a good fit for many markets, Moore is looking to the cruise ship market, where an older customer base would be an ideal fit for e-bike rentals, and where stops on a route can disgorge hundreds of passengers who need local transportation but who want an alternative to a taxi or bus. Read the entire article here. This entry was posted in Nebraska / Midwest News, NewsBlog and tagged Bill Moore, EV World, green transportation, Nebraskans for Solar, Quikbyke, Treehugger on October 22, 2016 by Helen Deffenbacher.